The use of plastic is becoming an increasing concern in our modern society. Not only can it harm wildlife but it can actually harm humans too by creeping into our water supply, and in the manufacturing of food and drinks. More than that, it also consumes a lot of energy in its production and has been linked to a long list of health issues. Clearly the world needs to change its attitudes to plastic, and products such as the LunchSkins recyclable and resealable paper sandwich bags are aiming to do just that. It is an environmentally friendly product but one that is highly effective at keeping your contents fresh. A lot of products that are better for the environment turn people off because they are too inconvenient when compared to a cheaper plastic product. The LunchSkins bags though are very easy to use and also durable and reuseable, and therefore you don’t get those issues. They are very impressive products and hopefully ones that will be widely used and will also inspire other products to solve other plastic issues. Here though, we will delve deeper into the products to look at their key features, usability and overall ratings. There are a number of great features that help this product stand out as an innovative and easy to use sandwich bag. It is quite unique in what it is able to achieve as it has the environmentally friendly qualities of a paper bag while managing to have the usability of a plastic bag. It’s that mixture of those qualities that impress the most but there are plenty of other features that are very useful too. Here we look at some of the key features that it is able to achieve. Usability: Regardless of how good a product is for the environment, it’s hard for people to be interested if it’s going to be too difficult to use. That’s where this product is special though as it doesn’t fall apart at the first sign of water and it’s easy to lock in that freshness, especially with a great lunch cooler. The reusable bags are able to be washed in the dishwasher or easily rinsed out and therefore you don’t have to worry about the cleaning process afterwards and you don’t have to worry about filling up your bin with needless plastic bags. The recyclable bags are made of paper and therefore you don’t have to feel guilty about throwing them away. Both of the products are very easy to use and will be able to keep your sandwiches fresh for the whole day. 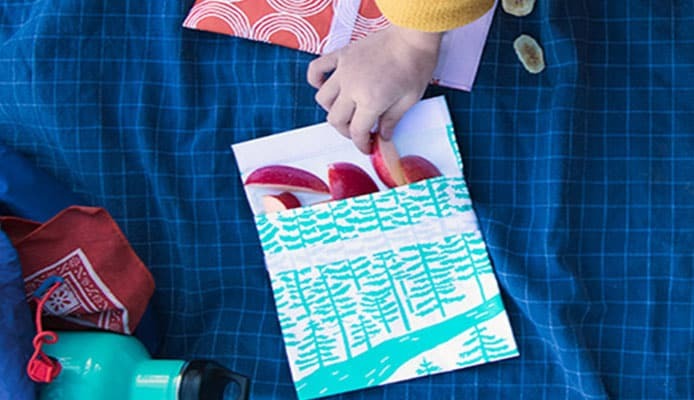 The reusable bags have a secure closure that will be able to be used time and time again and the recyclable bags have a peel-away strip that is highly convenient and these features make them ideal for camping and backpacking food storage. Overall, these bags are going to be as usable as any plastic bag and therefore you are not going to be missing out on anything with these products. They are highly convenient and don’t have any of the traditional drawbacks of environmentally friendly bags. Safety: These bags are also going to be very safe to use as well. 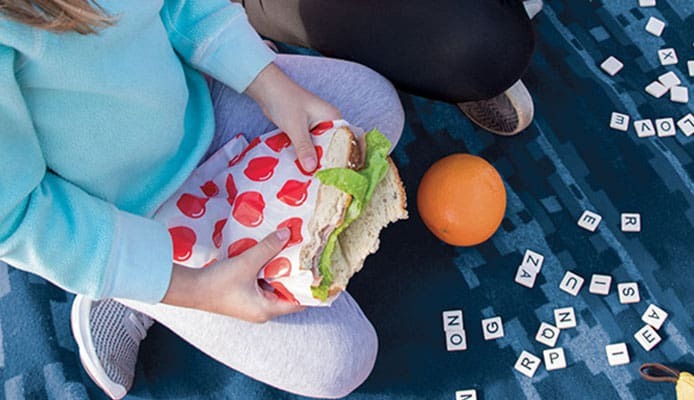 There aren’t any nasty pieces of material or chemicals used in the making of the product and that means that you don’t have to worry about anything getting into your food and you can happily place them in your picnic backpack or your picnic basket. It materials that are used don’t contain any toxins and it doesn’t contain any BPA or chlorine too. Further than that, it also doesn’t contain anything that is able to set of allergies such as gluten and soy, meaning that you will be able to use the bag with confidence. The ink used in the manufacturing is also very safe too, as this is vegetable ink which is food safe and also good for the environment. The products have been approved by the FDA and therefore you will have peace of mind that you have a high-quality product that all the family can use. Protecting the environment: You can see a future where these types of products are commonplace and will be seen in every home and you can also see a future where it would actually be against the law for a company to make a single-use plastic product due to the damage it can cause. While this is not a product feature that is going to help with its primary use, it is one that will make you feel better about using the bags and also feel better about the impact that you’re making on the world around you. The reusable bag is crafted from pasty fabric to give it the durability that it needs and the recyclable bags are completely made out of paper. The fact that these products can be made out of these materials without any significant downsides is a testament to the build quality. This is a product that you can’t help but be impressed by, while they are intended to be used as a way to avoid plastic, they are will able to excel in their key aspect of being a great carrier for your sandwiches and snacks in order to keep them fresh and tasty. Here we will look further into some key areas and how they match up. Price: 95% – One of the characteristics that made plastic so popular is that it can be very cheap. 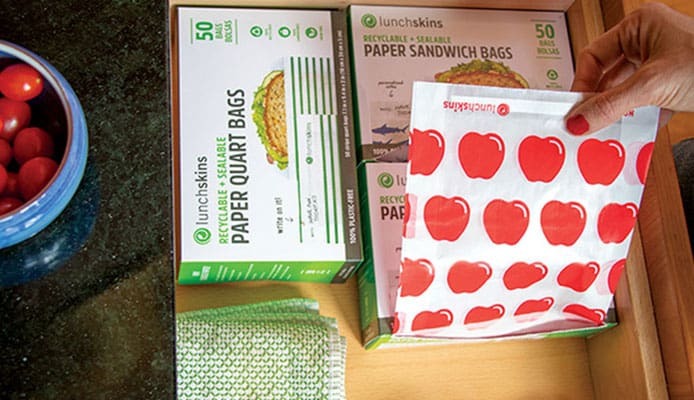 These products from LunchSkins though do a great job at being able to keep up with that and they are very reasonably priced.The reusable bag is going to last for a very long time and the recyclable bag comes in a generously sized packet that you are going to get a lot of use out of. It’s a very good price for what is a high-quality item. Material: 100% – If you’ve ever has food wrapped in paper then you will know the serious disadvantages that is can have. It can easily start to break apart and grease will seep through the paper and onto your hands.The way that these materials combat that with natural products is quite remarkable and the materials used are not only able to keep the contents safe and contained, but there is nothing there that is going to damage the environment or you either. 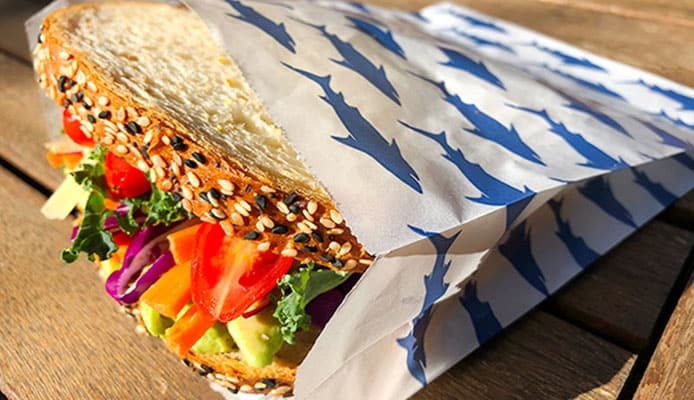 Design: 90% – For a sandwich bag, there is only so much design input that you are going to be able to have as you simply need to be able to cover and seal a sandwich. 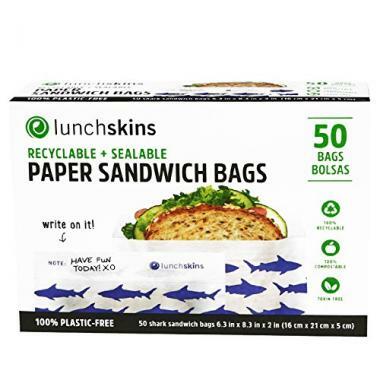 These bags do that very well for your standard size sandwiches.The only downside here is that they aren’t airtight and therefore they aren’t going to stay quite as fresh as plastic bags. If you simply fold the top over though, you will be able to get a decent seal if you wanted to keep it fresher for longer, but this isn’t a huge issue if you’re eating your food on the same day. Overall: 95% – Overall this is a great product that is going to be well worth the small investment that you are going to have into it. You’ll be left smiling at how good it is but also at the fact that you no longer have to feel guilty about using plastics.The materials used in the bags will enable them to perform as well as normal plastic bags but without the negatives that are associated with it. The design is perfect if you’re eating the sandwich the same day as making it, but if you’re storing food in the fridge, you can easily make an airtight seal. When you see a product that boasts a whole range of great upsides you wait in anticipation to see what the inevitable downside are going to be. With these bags though, those downsides don’t come and instead you’ll simply be left with a quality product that you will enjoy using. A lot of people don’t want to use a product simply because it’s the right thing to do, they also want to have the usability that they would have with the product that they have been using for their whole lives. These bags give you that usability and more. The LunchSkins recyclable and reusable bags are highly recommended products not because it’s good for the environment, but simply because they are great products. The eco-friendly aspects are simply a huge bonus. If more companies like LunchSkins make products this good, in both the environment and design, then the world would quickly say goodbye to most of its plastic use.